There’s this weird thing listed in the box score from today’s game: CG. You ever see that before? I’m stumped. 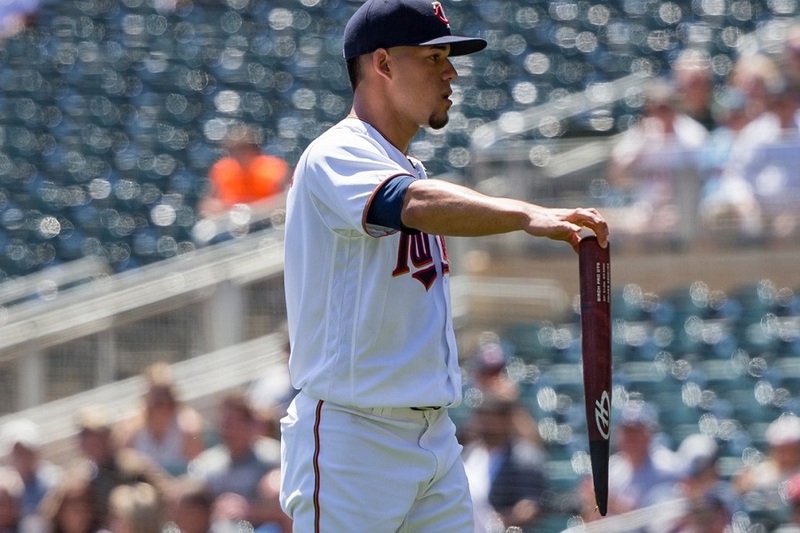 Whatever the heck it is, Jose Berrios did it today. He pitched nine innings … wait, is that legal? That’s gotta be a misprint. One thing that does look familiar in the box score is a bunch of crooked numbers next to the names of Eddie Rosario and Eduardo Escobar. They both homered. The Twins cruised to victory as the bats tallied seven runs in the first four innings and Berrios carried a perfect game through 4 2/3 innings. The Twins have been playing a ton of close ballgames. Just three of their last 25 contests ended with the score separated by more than three runs. All those tight games have put a tax on the bullpen, but a blowout also has to be a nice vibe for everybody on the roster. Berrios, wow. He went the distance, picking up the second complete game of the season. He only needed 109 pitches to do so, an impressive 78 of which were strikes. Jose racked up 10 strikeouts, reaching double-digits for the third time in 2018, and did not walk a batter. He got 15 swinging strikes on the day, but was also spotting his curveball, getting 10 called strikes on that pitch. Escobar got the scoring started with a two-run homer in the first, Ehire Adrianza hit a solo shot in the second and Rosario had a three-run blast in the fourth frame. Rosario also doubled and threw out a runner at home. I mentioned yesterday how there appears to be a fun battle for the team lead in OPS evolving. Well after today, Rosario is at .919 and Escobar at .902. Picking up a low-stress victory to salvage a series split was a great way to wrap up their series before the formidable Angels come to town. Chris Gimenez pitched to Eduardo Escobar. That about says all you need to know about this game. Just before I started putting these together, I was having trouble keeping up with an exciting Twins team that was performing above my expectations. My daughter was just about to turn one, and it was difficult to find time to invest into a game each night. Instead, my morning routine started to include digging through a half dozen sources. I just wanted to take a moment to thank Seth Stohs for this opportunity. I also want to thank all of you for reading these things and participating in the conversations that follow. I hope I’ve helped make things easier for you to keep up with the team on a day-to-day basis, or at least provided a bit of a different perspective than was previously available. The goal has always been to provide something valuable whether you watched the entire game or didn’t see a single pitch, whether you only had 15 seconds to spend at the site or had 15 minutes to dig through everything. Over the past 12 months, I’ve written something like 155 of these bad boys. It’s been a lot of fun, but I don’t expect to hit that mark over the next 12 months. I’m going to be letting a few more people contribute over the next month to see how things go. I suspect I’ll still be doing the vast majority of them for the foreseeable future, but there are some other projects I’d like to turn some more of my attention to. There are some other ideas I’ve had that just haven’t quite gotten to that “ding” moment just yet. Happy anniversary indeed. Thanks for these wrap-ups. Win or lose, I always read them. Thanks again! I really enjoy the way you write these.You write them how I feel about the game.Sometimes I like your take even better than my own.Thanks for doing these as I truly look forward to reading them. These have become an excellent addition to the site. As a displaced Twins fan they are invaluable, thank you. Thanks Tom. I very much enjoy your work. Much appreciated. BTW: "CG" = "computer generated." Something not actually real. And it makes for a much better evening after a game like this.Berrios said he went to sleep last night thinking 'he was going to pitch a complete game. 'Said he knew he had to do it.When Marney asked how much he had left in the tank, he said "2 more innings." 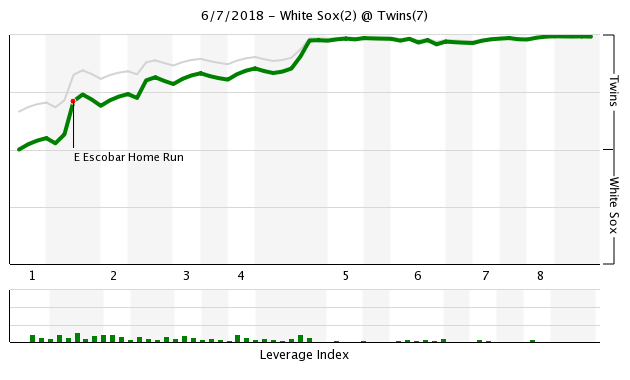 And the offense got going with a Rosario double and Escobar home run.Then another bomb by Rosario later to put it outta reach.This team needs more hitters helping out if they are going to keep feeling good! Happy Anniversary, Tom. Wow, Gimmy to Escy a year ago. I guess that team had some ups and downs too. Having a baby in the house is a weird deal. Exhausting in many ways, but it also forces you to be home a lot and if you're home, might as well get some stuff done while they're napping. Anyway, I love these game wraps. Thanks for doing it. Great game to celebrate one year with. Boy, how about these Twins! I'm going to enjoy the ride to 80-82 wins and a sniff of the division title. Some days like yesterday, some like today. There will have to be at least one hot streak in there as well. Until these guys hit their stride and play like a 100 win team every day, I'll join right in with the griping. Infuriating as they are, there is a lot to like, and they have at least earned our hope, if not our trust. You have a baby in the house? Enjoy them now, because this is about as easy as child rearing gets. Where would this team be without the Eds? Going to MLB for recaps is great but then there is no discussion.Game threads are great but I didn't want to read through 5 pages of it to see if something had already been discussed to death in that thread.Baseball Reverence is great but they are a little slow to post and kind of annoying to go there to find out what time the next three games are. and check the standings.I still go to those sites but now I don't go from one to the other several times to find out what happened in last night's game. Thanks for all you do Tom. No, those days have passed, although I'm home with a sick six year old right now. Agreed, Mr. Pixel, er, Sixel. Nice job, I see most of the games but I never miss your write up. Thank you. . Btw, dont worry about child time. Eventually they will change their mailing address, but they never leave home. As a father of 2, my experience was, 0-2 is sleep deprivation; 3-9 is just the tops of the tops - you the man, or woman, in their lives; 10-18 is the challenge of balancing what the kids want and the outside world with the relationship you have built up to that point. Good cop, bad cop, friend or parent, it all gets muddled. 18-24 is where it all comes together for better or worse. In my case, it was better, but I've watched it go south with some of my kids' friends. Best of luck to all of you who are parents. Certainly puts baseball in perspective. Thank you for all of your work on these, Tom. My work/life balance has really sucked the past two years and my time here, as well as games watched, has dwindled as a result. These game wraps are the one thing I make sure that I read each morning regardless of whether I caught the previous night's game or not. Thank you and keep 'em coming! These game recaps are officially one year old! Time flies when you're doing great work, huh? Eventually they will change their mailing address, but they never leave home. Consider this one stolen for my one-liners file. Happy happy anniversary, no morning is complete without my coffee and Twins Daily. Tom, your work has been both exceptional and consistent. We are blessed to have you creating these threads and for everything else that you do here. Eh, they are ok. Whatever. No, really, Tom, exceptional work on the recaps. Thank you, and happy birthday! And by the way, CG OBVIOUSLY stands for “Capitals Goal”, which reminds me of who your Stanley Cup Champions are! My first was born yesterday. Holding him and reading the wrap. Happy birthday to both of you. My wife and watched yesterday's game after 30+hours without sleep, and decided on a name. Ed. Thank you for your efforts, Tom. Congratulations. And I like the name. Will it be Ed, Edward, Eddie, or Eduardo? There's also another option: there's a player in the HOF named Edd Roush. Edd with two d's. Best of everything to all three of you!